The Aston Martin DB7 and Jaguar XK8 are both British GT cars that were built while their makers were under Ford control. Both cars were brought to the United States for the 1997 model year and both were sales successes. Now over 20 years later and depreciation has hit both performance machines hard, but which is the better value on the used market? The Jaguar XK8 has taken the bigger hit with plenty of early examples in good working condition to be found for under $10,000. The Aston Martin DB7 is more rare, but there are a number of good examples with well under 50,000 miles on them for under $35,000. We’ve also found some higher mileage examples that can be had for under $20,000. Now the question is if the DB7 is worth the roughly $20,000 premium over the XK8. From a badge stand point, the answer is yes, but is it a better drive and easier to keep on the road? The Jaguar XK8 has a V8 engine, but it has a decent amount of known issues. This is a British car and during this time period they still weren’t the most reliable of machines. Some XK8s have had electrical issues as well as overheating issues. The overheating is often due to a faulty thermostat and that is easily repairable. The bigger issue with the V8 engines are the plastic timing chain tensioners which can fail and cause engine damage. Proactive maintenance of the timing chain tensioner is highly recommended to avoid this potential problem. The DB7 has a few common problems itself. The electrics can cause strange issues such as the radio to failing to work at times. The liquid filled engine mounts can have issues causing a vibration. In manual cars this is noticeable because the shifter lever will move up and down. However, for the most part the supercharged inline-six engine has shown to be fairly reliable. From a driving stand point the Jaguar is more of a pure GT car making it effortless to eat up the miles. However, this makes for a less sporty drive on a curvy back road. The Aston Martin is definitely closer to a sports car, making it not quite as comfortable on a long drive. 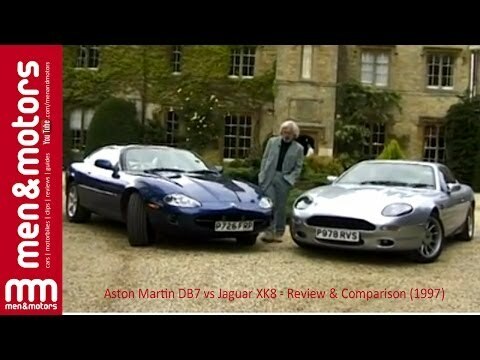 So, which would you choose the less expensive Jaguar XK8 or the more exclusive and more expensive Aston Martin DB7? Scroll down to the comments and let us know what you would put in your garage.